The brilliance of camping out under the stars and backpacking through the deep woods is the ultimate drive to getting out on your next adventure. You are going to want to be prepared in order to fully enjoy your big outing. You will need proper sleeping equipment, and perhaps most importantly the best down sleeping bag that you can get for your trip. When you are packing for your trip, you are going to have a lot of big items in your backpacking bag, so finding a compact sleeping bag is incredibly important. In this article, we will cover the benefits of splurging on a down sleeping bag, and how to pick the best model for your backpacking needs. 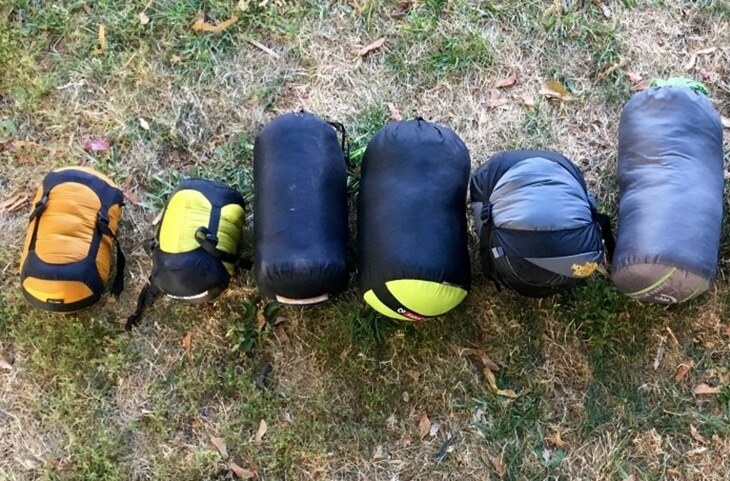 Down bags are a pretty big investment, so at the end, we will cover the care required to protect your new camping addition! The down sleeping bag is really made for the backpacker who plans on being out in the wilderness for the weekend or longer. The amazing fabric is designed to have special qualities that allow it to be and easily packed. When you are packing your backpacking bag you are going to want equipment that is lightweight, durable, and provides the warmth required. There are quite a few materials to select from when you pick a bag to add to your camping equipment. Down material is going to give you the best warmth to weight ratio you can get. Down is soft feathers on either a goose or a duck that is both incredibly lightweight and insulated to keep you warm. The sleeping bag will be down on the inside and normally some kind nylon on the outside for durability. 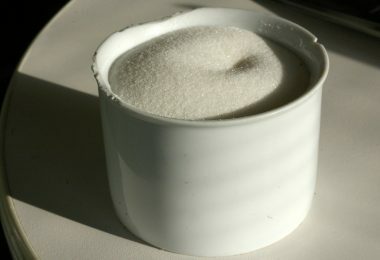 What down is known for is it’s long lasting characteristics, especially when it is taken care of correctly. Unlike most synthetically made sleeping bags, a down bag will keep its warmth for a long time, even with many uses in rugged terrain. It stays light, fluffy, and warm and can outlast other bags as much as three times. When you invest a lot of money into a sleeping bag, you are going to want to have a bag that will keep up with all of your adventures. There is a lot of big equipment that has to fit into your little backpack, so you will want to choose everything that gives you more space and less weight. Down packs into your bag incredibly small, providing you space for food, water, and a tent. Purchasing down allows you to maximize the space in your packing, without sacrificing warmth and comfort. 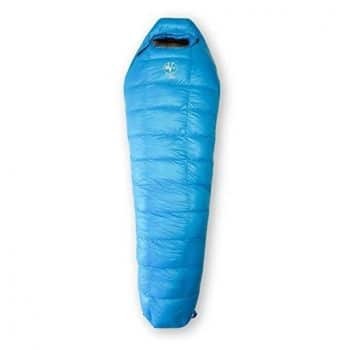 While down may seem like the perfect option for a backpacker there are a few things to consider before running to the store to buy the best down sleeping bag. The things to consider include the type of adventure you are going on, and the weather you might encounter while you are out on the trail. 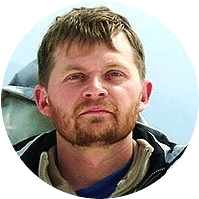 If your plans do not include a week long ultra light weight backpacking adventure, and instead are filled with car camping in kind weather, then down may not actually be the best option. 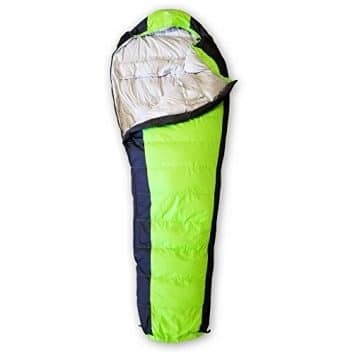 The big bulky sleeping bag can provide extra comfort and they tend to cost a lot less than a down bag. 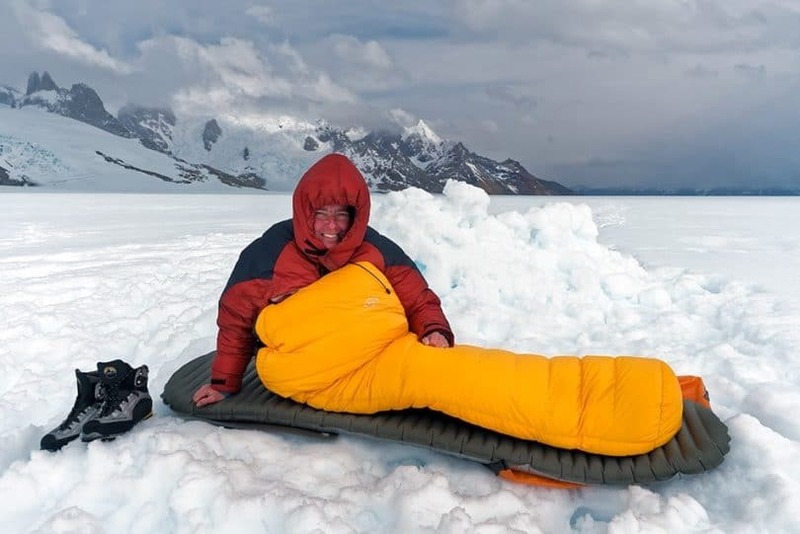 When it comes to weather, down sleeping bags also have a pretty big con. Unlike their synthetic cousin, down materials do not dry quickly and are not great with moisture in general. 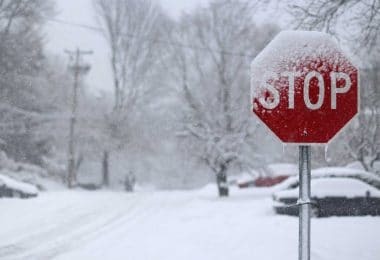 If you are headed out in the rain or the snow, then you will either want to look at synthetic bags specifically for that trip or try and find down synthetic bags with water resistant coatings. Even with the coating, wants its wet the sleeping bag will be difficult to dry while still out on the trail. A down sleeping bag can cost you quite a bit of money, but it will last you a long time as long as you take care of it properly. 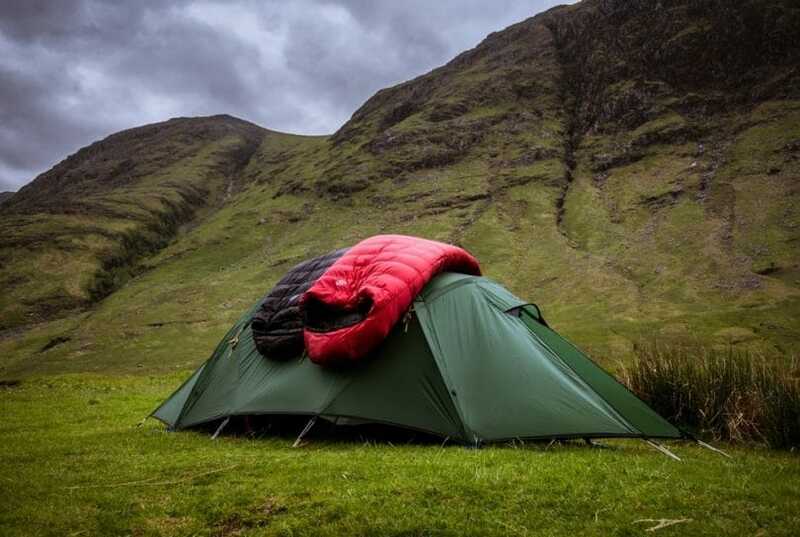 The best way to keep your sleeping bag in great condition is to purchase a lightweight liner for the inside, this way you won’t have to wash it quite as often, which can damage the down. When you do wash the bag, make sure to keep fabric softeners or bleach away from the washing machine. Additional heat on the sleeping bag can ruin the water repellent treatment, so hang dry the sleeping bags on the often built in hook loops. Now that you know the pros and cons of buying a down sleeping bag, we have a few options for you to look over in your quest for the best. Finding a sleeping bag will require you to first decide what type of adventure you are headed out on and whether or not it is worth the investment. 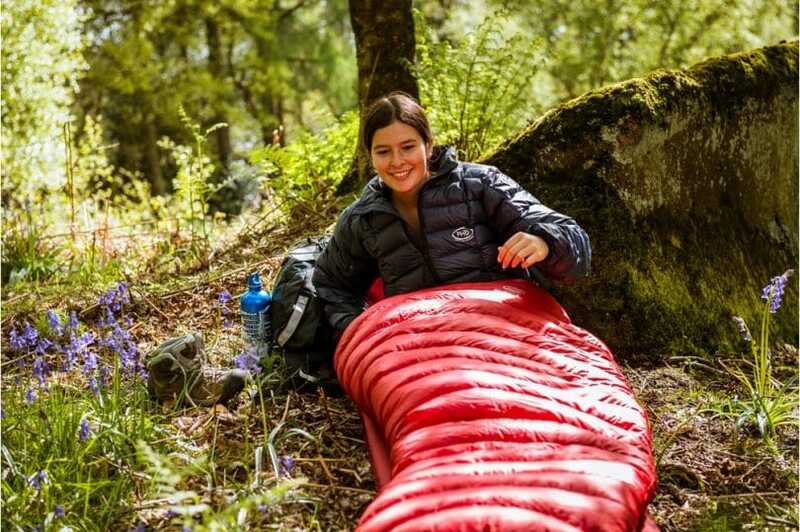 Specific Features: The lightweight sleeping bag features water repellent 400T ripstop nylon fabric, with snag-free Velcro, and plenty of space for your shoulders and hips. The down insulation will keep you incredibly warm, even in 0-degree weather, making it a four-season bag. Best use: Backpacking and four season camping. What customers love about Hyke&Byke Snowmass 0 Degree outdoor excursion bag is how incredibly lightweight it is, and how warm you stay in the bag during the cold night. The size of the mummy bag accommodates even those with a larger shoulder frame, and you can even get larger and longer versions. It has a roomy foot box and hanging loops for easy storage and drying. The few things that can be approved on in this excellent down bag is the quality of the zipper and the outer fabric that is a bit thin for some user’s comfort. That being said, if you find yourself with a faulty zipper, you can contact Hyke and Byke to have It quickly replaced. Weight: 1 lb and 13 oz. Specific Features: The lightweight bag features a full down collar to keep you warm even in twenty-degree weather. The down sleeping bag is rated as high loft, making it really fluffy and light, for the ultimate comfortable sleep. You can also compress the sleeping bag down to fit into even a small day bag. Best use: Backpacking and biking trips. Western Mountaineering has created a sleeping bag that keeps you both warm and comfortable with its high loft down. While it is not an all seasons bag, it does retain its heat to 20 degrees and is stitched with durability in mind. The company has made several sizes for the adventurer of all different heights and weights. 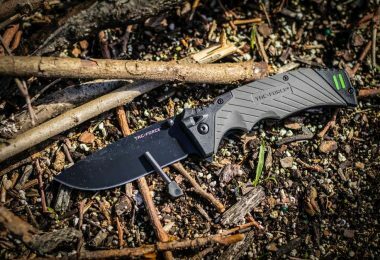 What is perhaps the favorite feature of the UltraLite 20 Degree is the collar around your neck that traps in the heat without compromising its lightweight feature. What is not to love about the bag is its lack of water resistant proofing on down material, which will be difficult to dry out on the trail. Specific Features: Outdoor Vitals reinforced the two-way zippers on this bag with specialty guards and installed hooks and a durable little compression sack. They have also included a little pocket on the inside for a cell phone or a flashlight. 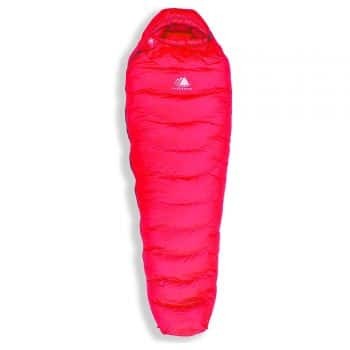 It can also be zipped with another sleeping bag for twice the space and 25% more warmth. The Outdoor Vitals Atlas Sleeping Bag are rated for as low as 15 degrees Fahrenheit and will keep you warm with the high-quality duck down fill and an additional water repellent coating. What backpackers love is that the included compression bag works like a charm and packs it down very small. A word of warning, if you are on the larger side than this bag might feel a bit snug, especially around the shoulders. Most mummy bags are cut tighter around the shoulders and this bag is no exception. Because it runs on the smaller side, someone who is known to toss and turn in their bag may get really uncomfortable, quickly. Specific Features: The bag features full ripstop polyester with a polyester fill and reinforced zippers that allow for extra ventilation. It can go down to zero degrees Fahrenheit and will keep you comfortable with the Coleman’s ComfortSmart Technology. Best use: Cold weather camping and backpacking. What we love about Coleman North Rim Extreme Weather bag is that it will keep you incredibly warm, and the straps that allow you to adjust the hood create a snuggled in feeling. The bag also opens up all the way to create a comforter if you need it. This bag is a little too big for backpacking, it’s on the heavier side, and even though it includes a compression bag, it doesn’t pack down very small. The zipper on the bottom is a two-way zipper so that you can get extra ventilation during the night, which is helpful but the quality of the bottom zipper is not great. Some have complained that it gets stuck and has even ripped the. Specific Features: The 15 degree Fahrenheit bag is both incredibly warm with duck down and duck feathers, and waterproof coating. The mummy bag is designed to be ultralight and has a high loft count. It comes with its own compression sack. Best use: Hiking, camping, and traveling. While you will be most comfortable around twenty degrees, Hyke&Byke Quandary 15 Degree bag can easily go down to 15 degrees Fahrenheit, the duck feather to down ratio with a high loft that will keep you warm. There is a water repellent ripstop nylon shell, to keep it safe and dry on long trips. 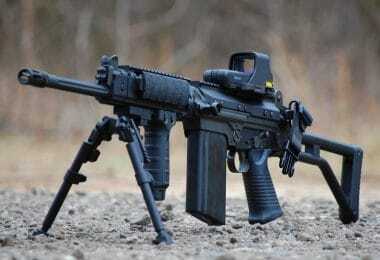 Hyke&Byke is a relatively new company and responds to any customer concerns. Overall people love that the bag is relatively lightweight for how much fill power it has, and the compression sack packs it small to stow away while you are on the trail. The bag is big enough that even if you toss and turn at night you can enjoy a good night’s sleep. Specific Features: This mummy bag features reinforced strong zippers, and can go down to 30 degrees Fahrenheit comfortably. It has a strong nylon lining, with lightweight cotton down filling. It comes with its own stuff sack and is a durable three-season bag. Best use: Hiking, music festivals, day to day use. The Lightweight 35 Degree is an excellent value for a three season bag. It is lightweight and cotton stuffed so it will keep you comfortable in temperatures around 40 degrees. It has enough wiggle room, even for those with wider shoulders. It doesn’t open up to a full blanket, however, so for warm weather camping, it is hard to get ventilation. 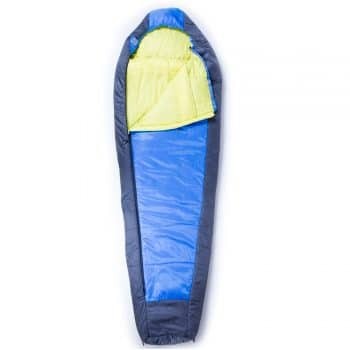 While this sleeping bag does compact down really small, it is not the most durable sleeping bag on the market. Some have noticed that after one or two trips the seaming along the side of the sleeping bag has started to fray or unravel. 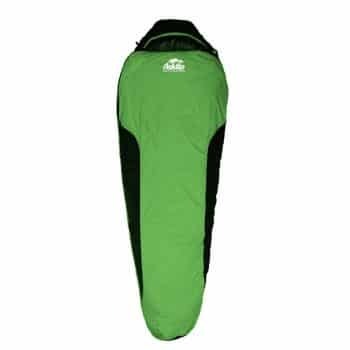 Specific Features: The three season bag has a reinforced ripstop polyester outer shell that features the longest length sleeping bag on the market. They have reinforced the strong zippers with a no snag performance standard. There is a microfiber lining and it is both ultra soft and light. Best use: Backpacking in warm weather. The Rovor Buhl 14-45 Degree is water repellent but not waterproof so if it gets wet while you are on the go it may take a while to dry out. That being said it is a microfiber-based sleeping bag, so it will dry faster than a traditional down sleeping bag. It is light weight and compactable, making it ideal for warm weather backpacking. What reviewers love most about this bag is how incredibly long the sleeping bag is, giving you plenty of wiggle space without sacrificing space in your backpack. Specific Features: Constructed to be incredibly light the bag features a fully-baffled and insulated bag, that is perfect for the ultralight backpacker. The full-length zipper is a YKK making it both durable and strong. Finally, the bag features an insulated draft tube to keep you nice and warm. The Western Mountaineering Summerlite bag is incredibly warm, soft, and durable. Western Mountaineering made their bags in best quality to last for a long time, the reinforced zippers and draft guard make for a sturdy and warm bag. There is plenty of room at both the shoulders and the feet so larger hikers or those who like to move around at night will be very comfortable. You will get an excellent sleep, as the bag has been described as sleeping on a cloud thanks to its fluffy microfibers. 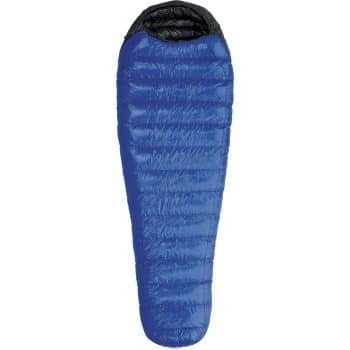 Specific Features: This sleeping bag has 800 fill power down making it incredibly insulated and still lightweight. There are reinforced YKK zippers and comes with its own compression bag for lightweight backpacking. It’s a three-season mummy bag with 20D ripstop fabric for the outer shell. 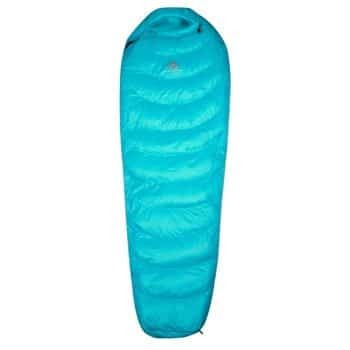 The Outdoor Vitals Summit 20°F sleeping bag is both durable and water resistant, with excellent ripstop water repellent fabric to keep you warm and dry. 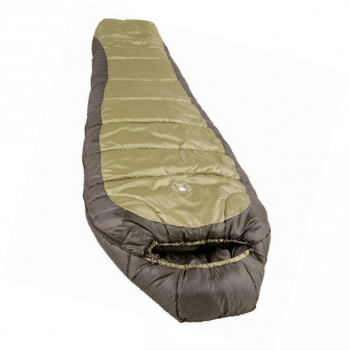 They have created the sleeping bag using grid baffle design so that the warmth is spread out equally. The insulated bag and face drawstrings allow for you to have a tight fit and to stay warm. Some have found that the draw strings around the face are made out of a cord that tends to fray after use, making it uncomfortable while you sleep. That being said it is going to keep you warm all the way through fall, and has plenty of space to move around in. 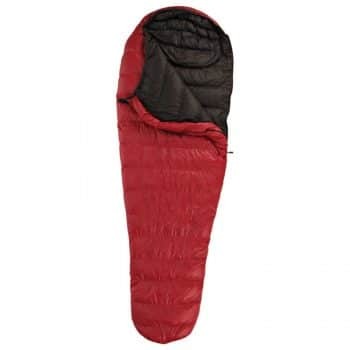 Getting a down sleeping bag will keep you warm and comfortable on your long backpacking trips. This investment can be easy to care for, and when constructed correctly will last you for years. they will last you for many adventures under the stars. The down bag is constructed to be ultra lightweight, so you can happily bring along this bag on a long term hiking adventure. When you select a bag for your big trip, take into consideration the weather conditions and the type of outdoor sleeping you will be doing. 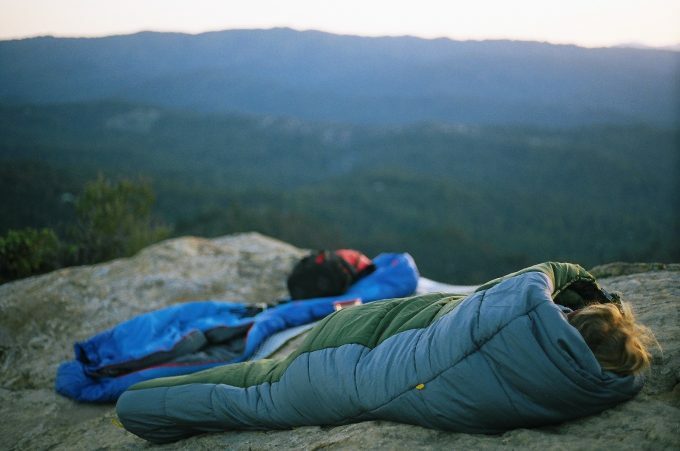 Have we missed your favorite down sleeping bag, or do you have a tip on how to keep them in their best condition? Let us know in the comments below! 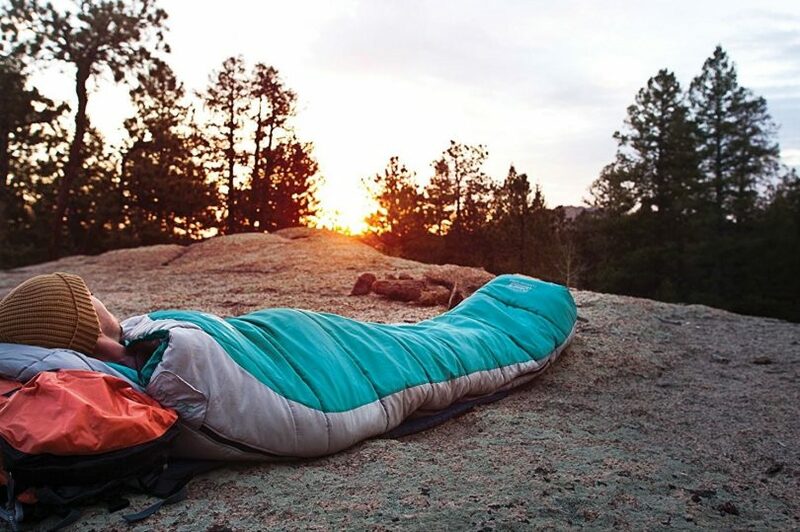 Best 2-Person Sleeping Bag: Outdoor Cuddle Time!